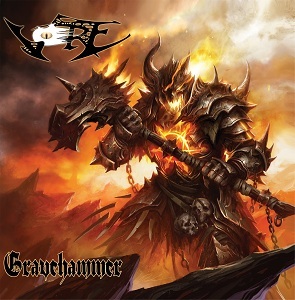 Formed in 1994, Death metal band Vore have self financed and released four albums, the most recent being Gravehammer in 2011. The band have now signed with AFM records and are re-releasing Gravehammer as with AFM's backing it will reach a far wider audience. The band have a good live reputation and have performed with bands including Cannibal Corpse, In flames, Morbid angel, Deicide, Obituary, Carcass, Manowar and many more. Musically if you've listened to the band before then you'll have a pretty good idea what to expect from the new album - after 18 years then there aren't really any surprises here. It's their usual style of crushingly heavy death metal. THere is less emphasis on speed than with some bands, but there is a real emphasis on making the music seriously powerful - its the sort that played through big enough speakers would probably shake your house to bits. The vocals are the usual growling style that you associate with death metal. It's not all monotonously heavy though - "Uroboros" is a real change of pace - an instrumental pice just over a minute in length with some nice intricate acoustic sounding guitar work. THis breaks the album up nicely so that when they return to the really heavy stuff then it gets added impact. Is this a groundbreaking original album? No not really. Is it a good album? Most definitely - it's a very good death metal album. Overall it's a good solid album that's worth a listen if you're a death metal fan.